Indeed, but to get the very best value from a bank today requires Chairs and CEOs with a level of mature leadership and rare, operational capabilities in human governance and human capital management that are only currently observable in a tiny minority of exemplars. 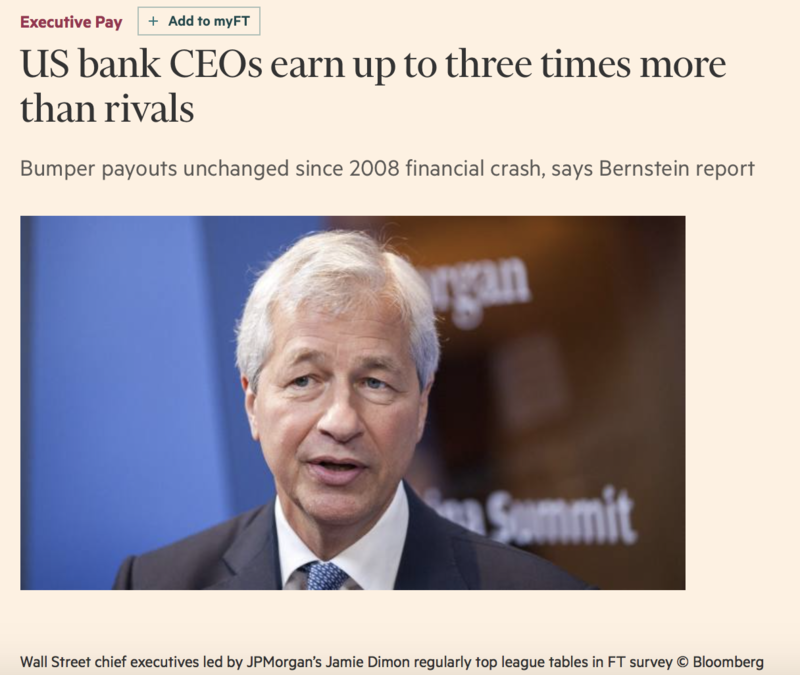 The FT and Bernstein have again highlighted the extent to which the executive pay system has been broken. 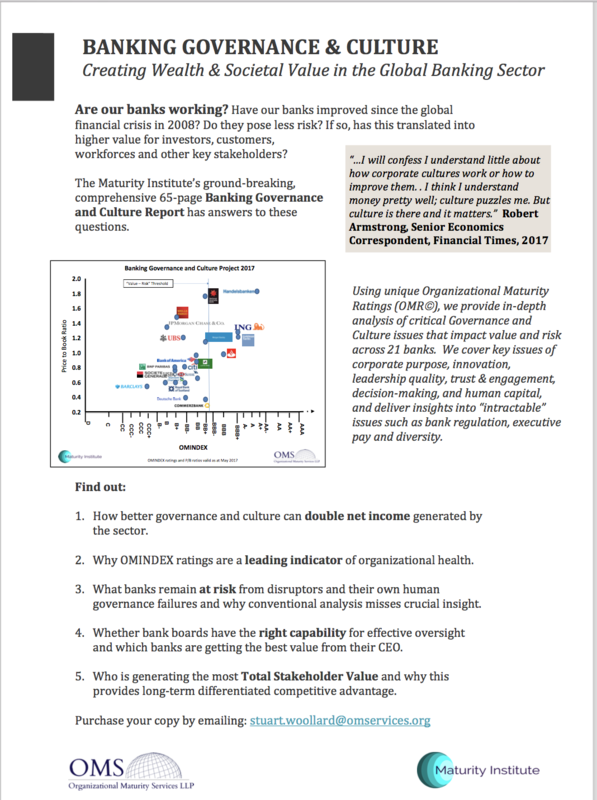 Our commentary, contained in our Banking Governance and Culture Report has found lengthy remuneration reports that serve to confuse rather than clarify. In most cases (of a group of 21 banks) remuneration principles are conspicuously absent; resulting in a failure to link pay to long-term value. Instead we found a predominance of pay driven by “market competitiveness” (sic) that has created a vicious upward ratchet effect in pay magnitude. Our experience in remuneration analysis (see MI Standard) has already revealed a myriad of unnecessarily complicated plans, which are designed to conceal and obfuscate. When the over-long and confusing narratives are stripped away what is left is pay geared to incentivize financial return to the detriment of broader value drivers (such as product or service quality). MI’s revolutionary approach was developed to specifically consider pay against a much more comprehensive, global standard of value, namely Total Stakeholder Value (TSV). This asks the key question – how much real value are CEOs delivering and is their total remuneration package commensurate? 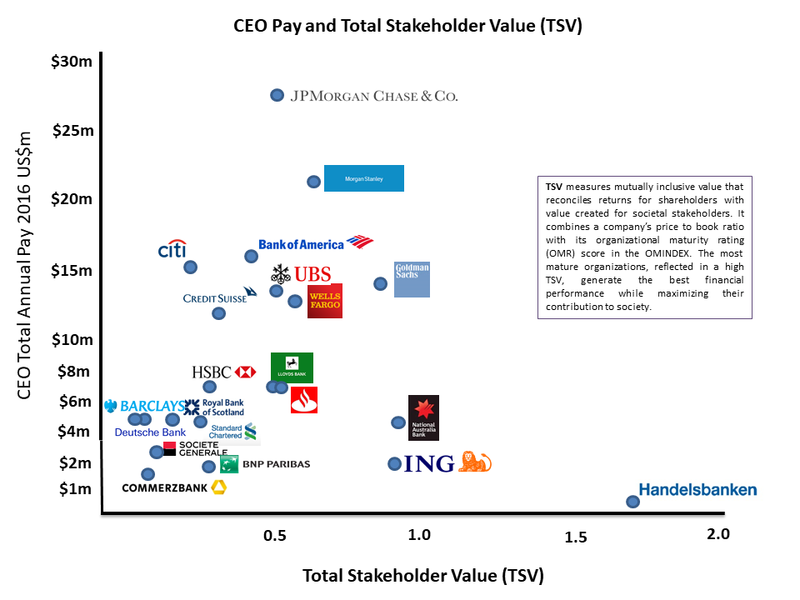 As our graphic highlights, only 3 banks manage to produce a credible link between CEO pay and TSV. These banks share a common set of characteristics including an alignment of corporate purpose, coherent pay principles and explicit linkages to long term value. They have created, at least in some rudimentary form, what we recognise as a legitimate CEO value and reward system. TSV, as the name suggests, serves all stakeholders, including banking authorities and regulators. JP Morgan shareholders may be getting ‘good’ investor returns by conventional standards but this level of performance can clearly be seen as sub-optimal when referenced against more mature peers. Moreover, customers of JP Morgan remain poorly served and serious quality and misconduct issues have arisen on a regular basis. In contrast, Handelsbanken (who annually provide base salaries only) and ING provide object lessons in how pay structures can be put in place to attract and retain CEO talent that drives high TSV. In short, these banks are getting much more bang for buck. So why don’t all others follow suit? This entry was posted in CEO remuneration, Governance, Maturity Tales, Organizational culture, Organizational maturity rating, Performance management, Whole system thinking and tagged executive compensation, executive pay, executive reward, Total Stakeholder Value. Bookmark the permalink.